On April 12, 2018, the Eastern Partnership Civil Society Forum (EaP CSF) attended the 6th meeting of the EU-Ukraine Civil Society Platform (CSP). Plamen Peev, from BlueLink Foundation, represented the Forum and addressed recommendations for the environmental cooperation between the EU and Ukraine. 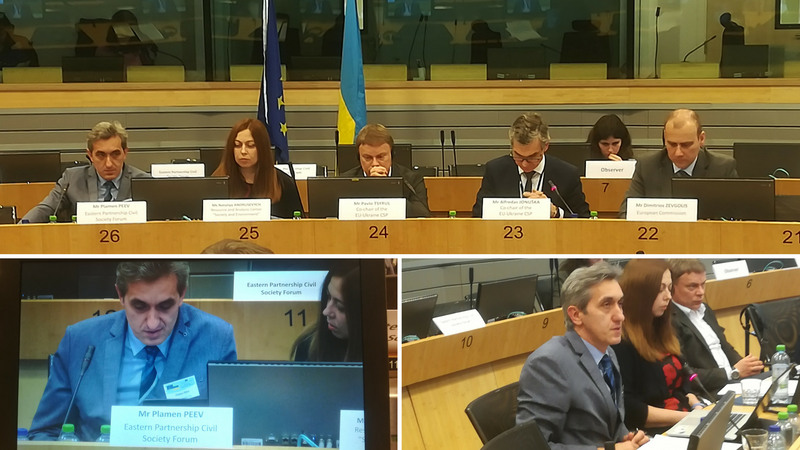 Mr Peev presented Ukraine’s commitments under the Paris Agreement and the environmental and climate change perspectives included in the EaP 2020 Deliverables and the EU-Ukraine Association Agreement. To recognise environmental and climate challenges as transboundary and interdependent by nature. To encourage cooperation and active engagement among governments, local administrators, civils society, the private sector and other relevant stakeholders. To effectively integrate environment/climate change policies into other policies. To facilitate project preparation and implementation by avoiding bureaucracy and focusing on the monitoring of the results. To take into consideration local expertise as an important contributor. To adopt anti-corruption measures with the support of the civil society.